LASIK is a surgical procedure that uses laser beam to gently reshape the cornea cornea for accurate focusing of images on the retina. Aim of lasik is to optimizing unaided vision for distance. The presbyopic age group will require glasses for all kind of near work & reading.In this procedure microkeratome is used to create a corneal flap, the flap is then lifted and reshaping of the cornea is done with Laser. In Femto LASIK the flap is created with femto laser. Patients over 18 years of age with spectacle prescription in the past one year and no other eye problem can undergo LASIK / Bladefree LASIK procedure. In bladefree LASIK the corneal slap is created with help of lenses. It differs from other LASIK surgeries because the corneal flap is created using a laser as opposed to a manual blade. With this bladeless LASIK Laser technology, people with thin corneas who were one unsuitable for LASIK may now be candidates. 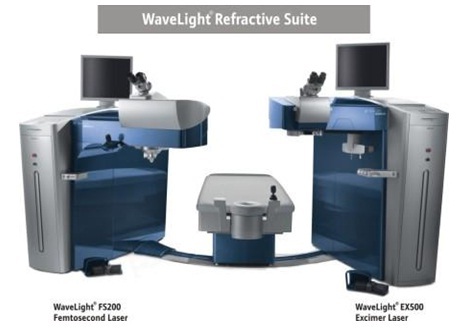 customizing your laser vision correction. Outcome may vary depending on and number of factors. The patient does not experience any pain during the Lasik surgery. The procedure is very comfortable for the patient. The Laser procedure is very fast and the In-to-out of the operation theater time is approximate.